A chubby-cheeked little boy whose serious expression turned him into a meme could end up educating an entire village. 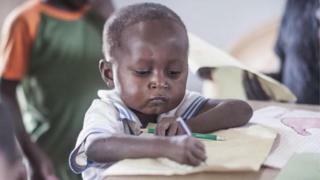 Jake has become one of the most famous schoolchildren in South Africa since people began sharing a picture of him, joking he was everything from a grumpy driving instructor to an unimpressed security guard. But Jake lives thousands of miles north, in a small village in eastern Ghana, unaware of his new-found fame. In fact, up until Wednesday, not even the man who took the photograph knew it had proved such a hit. Cameraman Carlos Cortes travelled to Ghana in 2015 to make a documentary about Solomon Adufah, an artist returning to his home country from the US. The picture of Jake, then four, was one of hundreds taken by Cortes while Adufah taught art and creative studies to the children. "I just caught Jake in the moment of his teaching," Cortes, of Chicago, told the BBC. "He definitely has a pensive look on his face." The two men then returned to the States, unaware they had captured a future star. But the schoolboy's picture began doing the rounds after Adufah shared it on his Instagram account. When he first realised it had gone viral, he was unsure of how to react to the posts, worried they were making fun of Jake. "I thought, I'm not going to respond," the 27-year-old told the BBC. "But then I remember a moment when I thought, what if all these 'likes' turned into actual funds to help?" Jake and his friends live in a rural village, and for some families sending their children to school is more than they can afford. What is more, the primary school is also in need of supplies. "I remember one day we spent 20 minutes just trying to make sure we had enough pencils for all the kids," Mr Cortes said. "That's what the campaign is really about." So Adufah, who has lived in the US since he was 16, set up a fundraising campaign, hoping Jake will really inspire people to turn their likes into cash to help pay for his education, and that of the other children in the village. Within 24 hours, it had raised $2,000 (£1,642) - 10% of its target. Adufah said: "This money could make a huge difference to the kids - this could be something really positive going forward." A documentary about Adufah's time in Ghana is being finished at the moment. See more of Cortes' photographs on his Instagram account.